Last night I slept like a log. I stayed in bed this morning and even had breakfast there. Lazy! My face is a little less swollen, but more purple! Today has obviously been used to clear up a bit. I tried to stay out of the shed but had to prepare a couple of paintings to be exhibited at the Oxmarket Centre of Arts in Chichester for the next couple of weeks. This is a sort of preview to the Chichester Art trail at the beginning of May in which I am taking part. If you are able do visit the Oxmarket, do. But even better if you are able to come to my Open studios the first two weekends in May. But, there is no peace for the wicked and I will be having a workshop on Tuesday and Wednesday this week. I went to the garden centre to pick up some plants in preparation for this. What an incredible assortment at the moment. I am sure everyone will find something that they will be thrilled to paint. Anyway, I am going to show you one or two of the RHS exhibits over the next few blogs – except for when I send pictures of the workshop. I won’t be able to show you something of every exhibit as not everyone gave permission for me to show their picture on the blog. I expect that you are wondering whose exhibit I am going to show now. 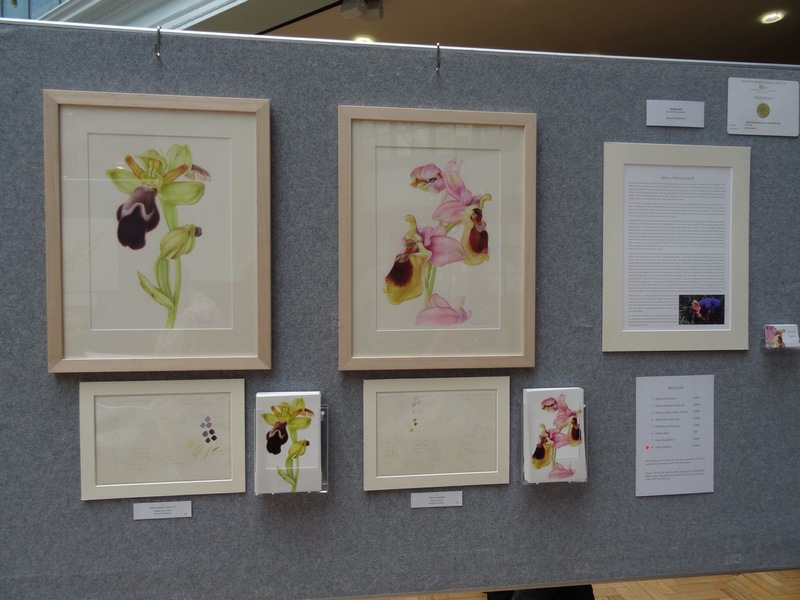 It is Bee orchids by Louise Lane. Louise got a Gold for her exhibit. In addition to her final pictures she also included her initial sketches showing exactly where they were done. I hope you are feeling better Gaynor. Your work was beautiful and it was nice to see someone who had used a frame- made it stand out from the crowd if you get my drift. I hope it was a successful weekend for you and that you got a chance to rest up on Sunday. Best wishes.